If forced to choose between classic, creamy American potato salad and the usually lighter German potato salad, I’ll always go with American. There’s something about creamy mayo dressing mixed with starchy carbs that I cannot resist, despite my strong German heritage. It’s the quintessential portable picnic/potluck side dish, refreshing and satisfying when the grill is raging and the humidity outside is 107%. My impression of mayo-free potato salads is that you’re getting a warm salad with a nice acidic vinaigrette. Nothing wrong with that, either, but it’s for another time and place. 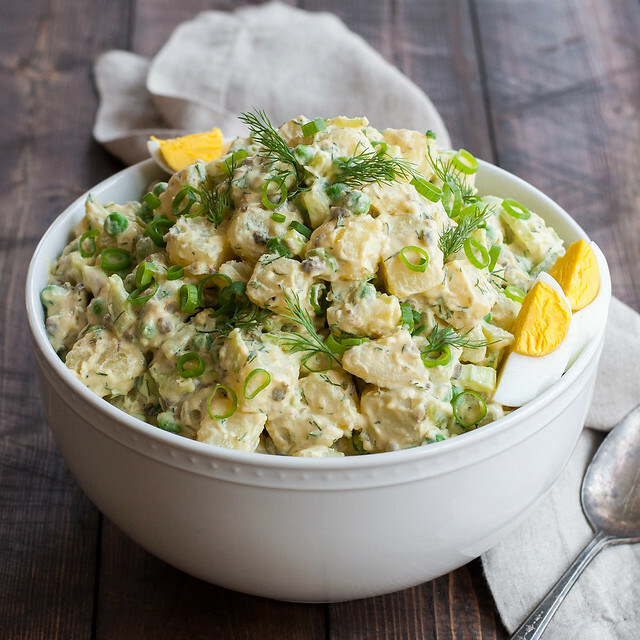 It wasn’t until the making of this potato salad recipe that I discovered I can have the best of both worlds: cool, refreshing potato salad with creamy, mayo free dressing. 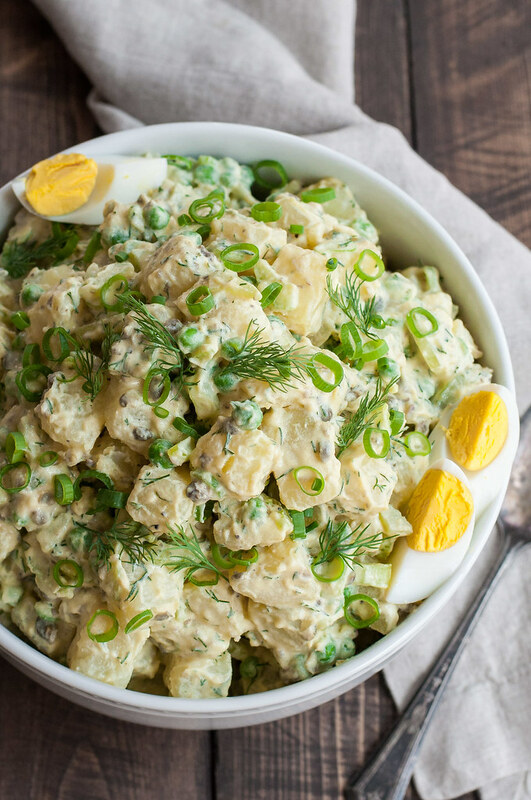 It’s hard to describe the hard boiled egg dressing on this potato salad as anything but dreamy, but I’ll do my best to be a bit more descriptive. Truth be told, the texture is mayonnaise-like, with hard boiled eggs standing in for the raw eggs. 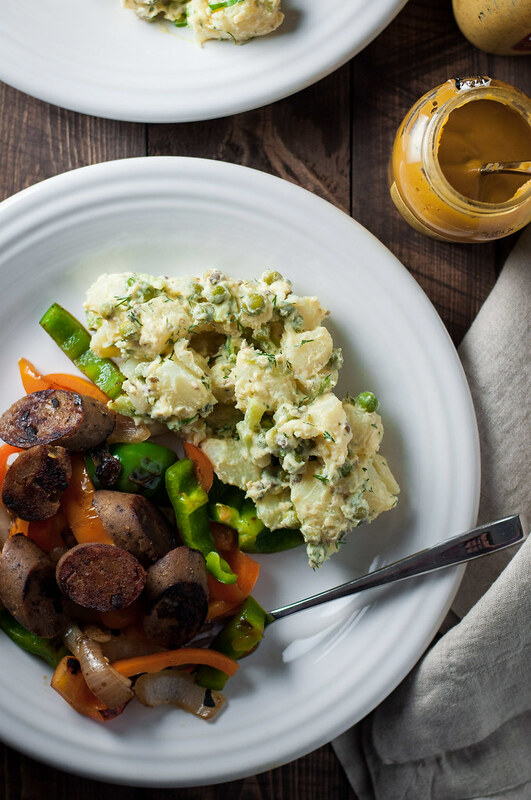 However, thanks to several key additions, the flavor takes potato salad dressing to a new level. Instead of vinegar, lemon juice provides a fresh-picked spike of acidity without being harsh, as white vinegar is wont to be. Dijon mustard keeps the color pretty and pastel, with a more sophisticated pucker than my beloved yellow mustard. While the process and ingredients resemble a vinaigrette, the end result is thick, whipped, and–I’ll say it–luscious. 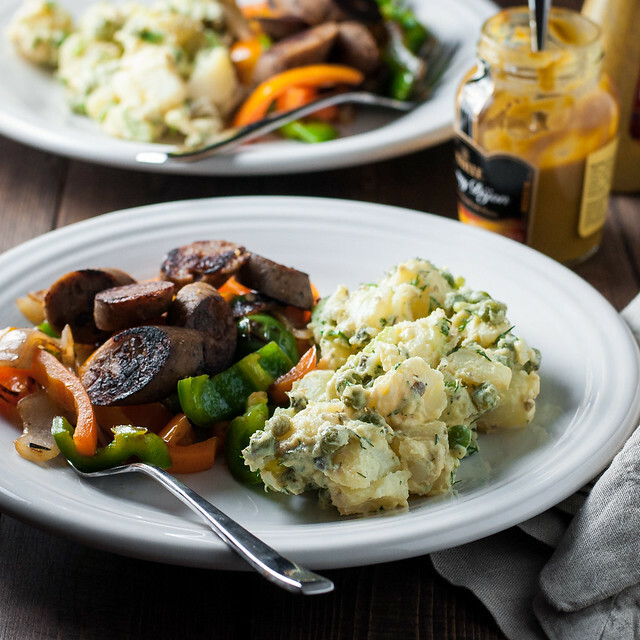 After the photo shoot for this slightly unconventional potato salad, I was doubting the photos. They’re most of the ones you see, with the gorgeous white bowl that I recently added to my serveware collection (love Crate and Barrel!). I usually go for a realistic look, so hopefully you can picture the dish in question on your dinner table, and I wasn’t getting that here. I felt like I spent too much time carefully piling the salad into the bowl, and that the pictures showed it. That’s not what it would look like at a potluck! I couldn’t take it anymore: I had to take some more later that day, using Steve’s dinner as my subject, which never makes anyone happy! But now I’m pretty satisfied that you’re seeing potato salad in its finest form here: alongside some sausage (ours was vegan) for a simple warm weather meal. In the early days of NCK, I created a super fun and colorful creamy Thai sweet potato salad. I love it! My photography skills were still developing, but I back the taste of the salad 100%. 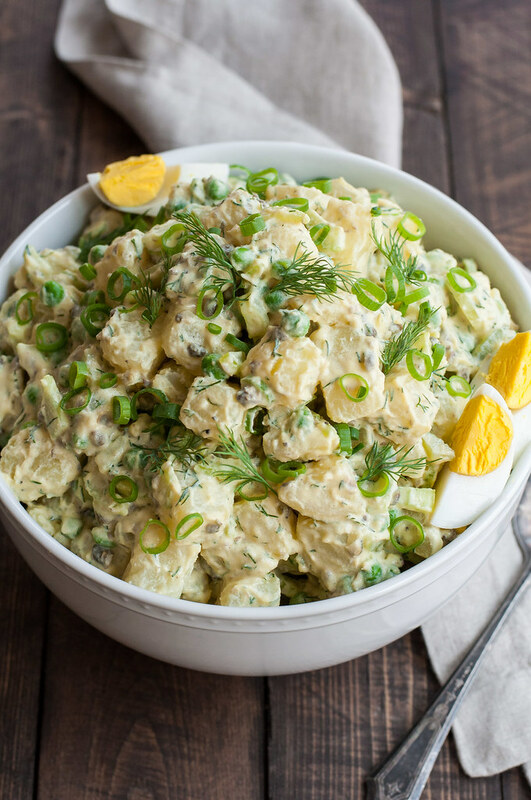 Instead of mayo, the creamy dressing on this potato salad uses a lemon and oil vinaigrette with just a couple eggs blended into it. 3 lbs. waxy yellow or white potatoes, peeled and diced ¾"
In a blender or food processor, combine lemon juice, dijon mustard, eggs, water, and a few grinds of pepper until smooth. With machine running, drizzle olive oil in until dressing is thick and smooth. Pour into a bowl and stir in capers, dill, and salt and pepper to taste. The capers are salty, so you won't need much salt, if any. Refrigerate until needed (can be made ahead). Put potatoes into a large pot and cover by a couple inches with water. Bring to a boil over high heat then stir in 1½ teaspoons salt. Reduce heat to a gentle boil (medium high) and cook 5 to 10 minutes more, until potatoes are just tender. Check potatoes often if they aren't ready after 5 minutes, to avoid overcooked potatoes and a mushy potato salad. Drain potatoes and rinse with cold water. Spread on a rimmed baking sheet, sprinkle with remaining salt and a little pepper, and refrigerate to cool. To assemble the salad, add potatoes, celery, peas, and white and light green scallion slices to a large bowl. Add dressing and fold gently to combine. Garnish with scallion tops and any extra dill. Note: This page contains affiliate links. It does NOT contain sponsored content. 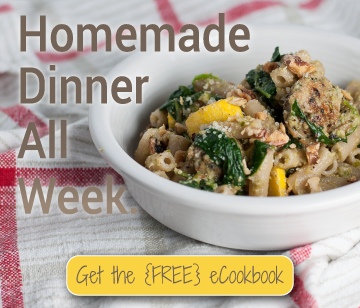 Affiliate links (to products I recommend, on Amazon) offset my ingredient and website maintenance costs, so I can keep bringing you picnic recipes like this one. Thanks!